Search Engines like Google and Bing track users actions for further usage. If you are searching on Google while logged into your Google account, beware that you all your searches and personal data like IP address, browser, screen resolution, Operating System etc. will be tracked by Google. Google says that they do this to give you better search results in the future. But if you don’t want Google or Bing to track you, you may use other search engines like DuckDuckGo which claims that they don’t track your searches. The problem with using any other search engine is that if you are used to using Google or Bing or DDG etc. it will be harder for you to switch to another search engine. If you want to further push your privacy to the next level, you can make use of Disconnect Search add-on for Firefox and Google Chrome. Disconnect Search will run your searches through a proxy server for improved privacy. Google or Bing or any other search engine will not be able to track you this way as they will be encountered with a proxy server while you get your desired search results from your favorite search engines. The extension will add an icon in your browser’s toolbar. You can click on the icon for configuration and settings. Disconnect Search supports five search engines at the moment: Google, Bing, Yahoo, Blekko and DuckDuckGo. 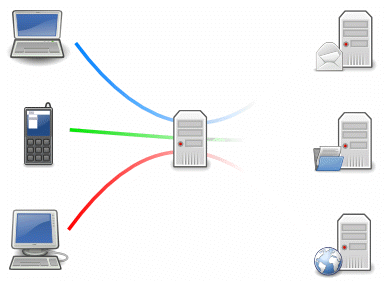 You can search from any of the supported search engines securely using the proxy server. To securely search from any search engine, click on the Disconnect Search icon, select the search engine and the search from the search field. You can check both the options in order to pass every search through the Disconnect Search proxy. One feature of Disconnect Search that I loved is that it will not let any information pass even to the sites that were opened from the search results pages. One thing to note here is that since all the searches are passed through a proxy, the searches and search engine page load times will be a little more than normal. What are your views about using Google anonymously through a proxy? To keep my Chrome extensions synced between multiple computers, I stay signed into my Google account. Does this in any way change the effectiveness or defeat the purpose of Disconnect Search?